I want to share a healthy delicious dinner recipe with you today; a carrot and orange soup recipe to be precise. This is a perfect light dinner even though it's not winter anymore, plus you can make extra and eat it for days (at least that’s what I do). I find soups are a really easy way to add more vegetables to your diet! Cop the onions. Peal and grate the carrots. Add the olive oil to a big saucepan and warm it up. Add the onion to the saucepan and once the onions have been cooked for a bit add the grated carrots. Add in the water and ginger and let the mixture cook for 10mins or until the carrots are soft. 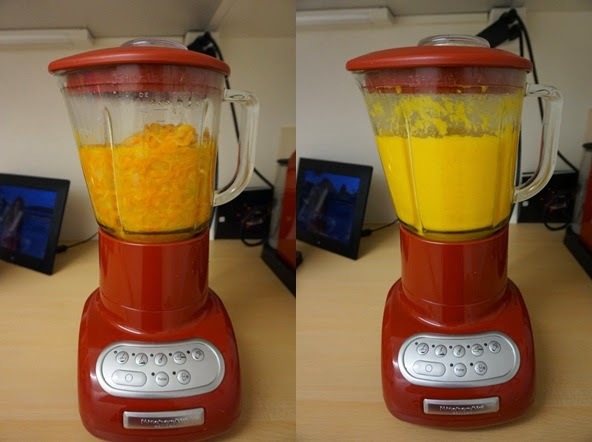 Let the mixture cool for a bit so that you do not burn yourself and then place the mixture in a blender. Pour the mixture back into a saucepan and add the juice of the two oranges and the greek yogurt. Heat the mixture again and add salt and pepper to your taste, you might need to add some more water if the soup is too thick for your liking. Enjoy with some warm whole grain bread and sunflower seeds on top. If you give this recipe a try please us the hashtag #debbieariella so I can see all your delicious creations on Instagram. What are you favourites soups?